Right now at the Newport Aquarium there is Water Wonderland with scuba Santa which features Santa and his underwater friends to talk to you beneath the sea in a special dive show. The aquarium is open daily from 10 a.m. – 6 p.m. Admission is $24.99 for adults and $16.99 for children ages 2-12 years old. The Cincinnati Zoo is is hosting its 35th annual PNC Festival of lights which includes over two million LED lights strung all around the zoo. It also has a puppet show in black-light, a new wild lights show on swan lake, and polar express train rides. Pricing for admission is $17 for adults online and $12 for children ages 2-12. Tickets purchased at the zoo are $19 for adults and $13 for children ages 2-12. It is open from 5-9 p.m Sunday through Thursday and 5-10 p.m Friday and Saturday. This event ends on January 1, 2018 so hurry and get there, you don’t want to miss it! Down at Fountain Square there is an ice rink that you can go ice skating at. It is a total cost of $10 after the admission and skate rental fees. There is also a Graeters across the street that serves hot drinks and sweets. Kings Island is hosting Winterfest again for the first time. 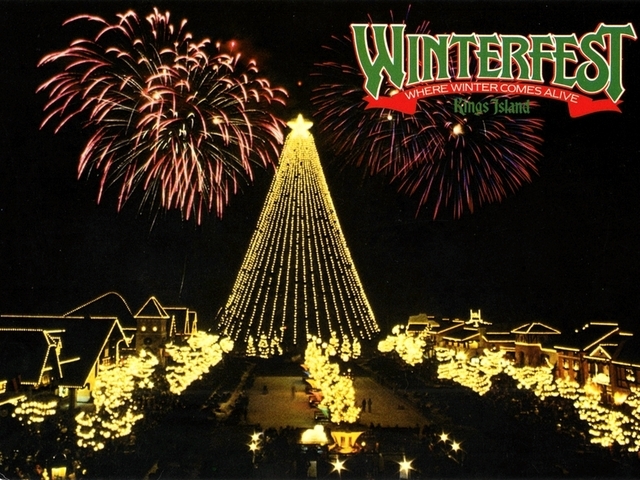 Winterfest consists of nine enchanting winter wonderlands featuring ice skating, the eiffel tower lit up like a Christmas tree, more than 5 million lights lit up, and up to 17 open rides. Winterfest ends on December 30th and admission costs $25 with other deals going on. At Coney Island, you can drive through a 2 and a half mile light show synchronized to rocking and traditional music through your car radio. Enjoy these lights and sing along music in the warmth of your car. Admission is $6 per person and is open every day of the week until 10 p.m. If you’re wanting a little bit of exercise you could go to Sky Zone indoor trampoline park. You can experience the fun of jumping around, playing dodgeball and jumping into foam pits with over 1,000 cubes. Rates for this event are $11 for 30 minutes, $15 for an hour, $19 for an hour and a half, and $23 for 2 hours.